Somwhere in the mid-80s, my family discovered that flourless could be fabulous, and mom and Aunt Ruthy started producing a series of delectable Kosher for passover desserts. This super-rich flourless chocolate cake reminds me of the "fondant au chocolat" I had in Paris. I prefer the smooth texture to "crunchy" flourless cakes made with whipped egg whites - and it's also much easier to make. Preheat oven to 350 °F. Line bottom of 9-inch-diameter springform pan with 2-inch-high sides with parchment. Place all chocolate in large bowl. Bring butter, espresso and sugar to boil in medium saucepan, stirring to dissolve sugar. Add to chocolate; whisk until smooth. Cool slightly. Whisk in eggs. Pour batter into prepared pan. Place cake pan in roasting pan. Pour enough hot water into roasting pan to come halfway up sides of cake pan. Bake until center of cake is set and tester inserted into center comes out with a few moist crumbs attached, about 1 hour. Remove pan from water. Chill cake overnight. Cut around pan sides to loosen cake. Place platter over pan. Hold pan and platter together tightly and invert. Lift off cake pan; peel off parchment. 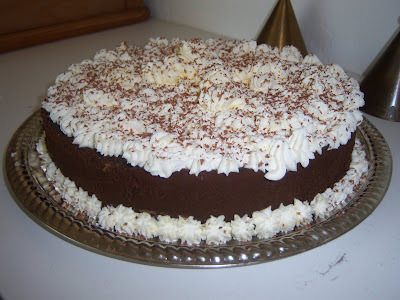 Whip cream and powdered sugar until stiff peaks form - spread or pipe onto the top of the cake. If you have some extra chocolate around, grate it over the top or decorate with chocolate curls. In a strainer suspended over a deep bowl, thaw the raspberries completely. This will take several hours. (To speed thawing, place in an owen with a pilot light.) Press the berries to force out all the juice. There should be 1 cup. In a saucepan boil the juice until reduced to 1/4 cup. (You can also do this in a microwave on high power. If you do so, make sure that you use a big enough heatproof glass measure or bowl to allow for bubbling.) Pour it into a lightly oiled heatproof cup. Puree the raspberries and sieve them with a food mill with a fine disc. Or use a fine strainer to remove all the seeds. (This part is really time consuming.) You should have 1 liquid cup of puree. Stir in the raspberry syrup and lemon juice. Measure again, there should be 1 1/3 liquid cups. If you have less, add less sugar. The correct amount of sugar 1/2 the volume of the puree. Stir until sugar dissolves.